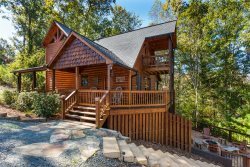 River Walk, located in the Coosawattee River Resort is a beautiful, cozy cabin privately situated on a large wooded lot and just a short jaunt to Mountaintown Creek where trout fishing is prominent. The creek (more like a river) is well known by fly fisherman and is "catch & release", fishing license required. The music of this creek can be heard on the porch of the cabin. Even if you didn't come to fish, the water is a welcome sight for guests looking to cool off and enjoy. The cabin itself provides guests with very comfortable furnishings including a beautiful King Master on the main level, a queen bedroom and another bedroom with 2 twins on the upper level. Both main and upper floors have full baths with tubs and walk in showers. The great room provides a beautiful gas log fireplace and cozy leather furniture and of course a 42" flat screen TV. Walk out on the porch where a large hot tub awaits to de-stress and rejuvenate. Downstairs, have some fun playing pool or foosball or enjoy watching a movie on the 42" TV. Two sturdy futons are provided for seating as well as additional sleeping along with another full bath with a walk in shower. As mentioned, the property is very private, located in a cul-de-sac but still conveniently only about 5 minutes inside the Resort gate. Of course as a guest of the resort you are privy to the amenities of the resort including the Rec Center where an Olympic size heated pool, tennis courts, basketball courts, exercise room, arcade area and putt-putt golf are located. There are also a couple of outdoor pools within the resort and of course in the summer months you can enjoy tubing in the cool mountain waters of the Coosawattee River. Don't put off booking your family's mountain getaway, and bring the whole family, this cabin is pet friendly (pet policy applies). Fabulous staff and excellent service. The cabin was extremely clean. We had an enjoyable stay and would use this rental company again. We had a great vacation here.the kids had fun going down to the lake and my younger son had A-blast on the tree swing. Great place, secluded but not isolated... fit our needs perfectly - we would definitely stay at River Walk again! Lovely quiet retreat. Property is well maintained and comfortable. We thoroughly enjoyed our stay and will go back in future.